The Stroke palette provides a variety of stroke types which determine how each brush is applied when the cursor is dragged on the model. 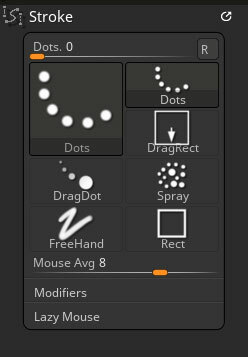 By default, most brushes are applied with the Dots or Freehand stroke selected — these produce lines which follow the cursor drag. Strokes can be selected by their numerical ID using this slider. The large thumbnail displays the selected Stroke. Clicking the thumbnail will show a pop-up window for choosing a different stroke. Mouse Input Average Count. The Mouse Average slider affects the way cursor input is processed by ZBrushCore. A value of 1 means the actual mouse position is used at all times. A value of 2 or higher means a number of mouse positions are read and averaged before arriving at a final value. This can result in smoother drawing movement. The Replay Last button re-traces the last brush stroke (from mouse/pen click to release), regardless of whether it was created using the same tool or settings. When LazyMouse is on, drawing will take place not under the mouse cursor, but under a brush point that is being ‘dragged behind’ the mouse cursor by a virtual string (shown onscreen as a red line.) This allows for very precise control of the brush point, and is ideal for drawing smooth, predictable curves, or any sort of detail work. Steps Relative To Brush Size. When the Relative button is on the LazyMouse stepping will be set by the brush size. Allows lazy mousing to be applied in discrete steps. As you pull the brush around, the brush effect will be applied at intervals determined by LazyStep. LazySmooth makes the lazy mouse effect stronger or weaker. When the LazyMouse feature is on, LazyRadius sets the length of the ‘string’ connecting the mouse cursor to the drawing point. The longer the string, the more precise the stroke, but the further you’ll have to move your hand to make it. LazySnap makes the lazy mouse snap to the model.